Lee's Boston Drum Builders Blog: What's Inside? This drum appeared recently on eBay listed simply as an "Antique vintage drum with stand" with little description and only one useful photo to tell the story (top left). It is in fact a 1910s - early 1920s George B. Stone & Son Separate Tension Orchestra Drum. And regardless of the drum's poor overall condition, it seemed to me like a good opportunity to grab some extra parts at a reasonable price for projects past, present, and future. So, I pulled the trigger and brought it in. 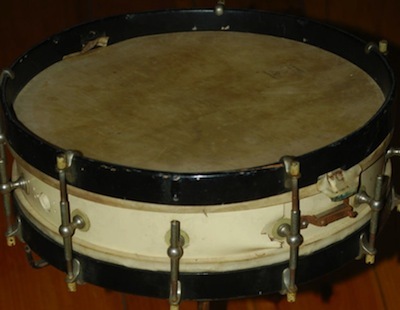 The drum is riddled with issues not the least of which is a badly damaged shell and a host of missing parts including its original Stone Patent Snare Strainer and Muffler along with seven tension rods and claws. Several other unfortunate aftermarket modifications were obvious once the drum arrived, among them numerous extra holes made for a heating element and an unoriginal Ludwig Professional throw-off. But the real discoveries came as the drum was opened up for the first time in goodness knows how many decades. The white paint job appeared from the outside to be so well done that for a brief moment I was fooled into thinking it was original. 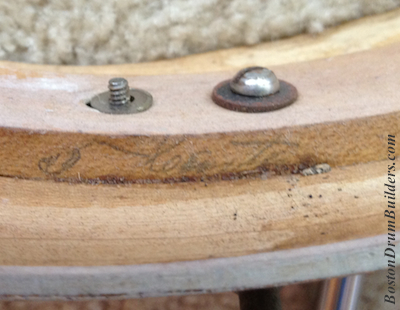 But stray paint inside the shell (middle left) tells the more complete story of a refinished drum. Also, the hoops which are now black were originally shellacked in a natural color to match the shell. Pencil markings inside of Stone drums are quite common, but as the reinforcing rings are completely loose inside of this shell, it allows for a deeper look into how these instruments were pieced together at 47 Hanover Street. Counterhoops and shells typically display a matched single digit number and the same appears true of the reinforcing rings installed inside of the shells. Underneath the snare side reinforcing ring are markings of the shell builder at work (bottom left). The marking reads "5 6 or 7" with the numbers six and seven crossed out. 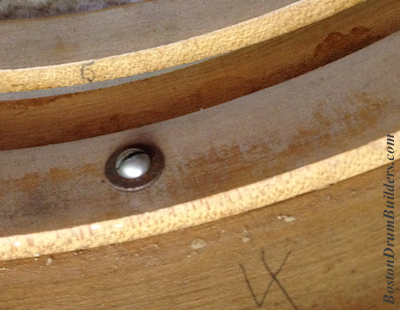 By process of elimination, the builder fitted hoop number five inside the drum and glued it in place. 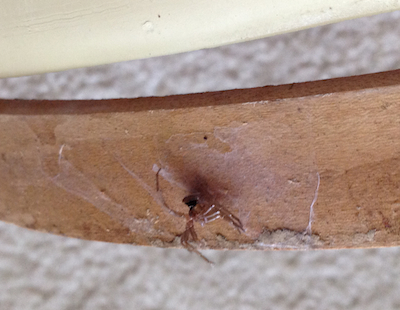 And lastly, (bottom right) you know an old drum hasn't been well cared for when it comes complete with a dead spider!